Buy in advance and save! OPEN BAR included with admission! This is what it will cost you at the door if you don't buy in advance. Special thanks to our friends at Silicon Valley Bank! for their support! Flying in from Houston, seriously. Everyone's favorite collaborative music site, Turntable.fm, has been rocking our headphones from the safety of our personal computers since it launched. Now, it's time to take that awesome energy to a new level. We're going to use turntable.fm to drive a dance party. Nobody, not even the DJs, will know what song is coming up next. You can forget those parties where a DJ queues up their entire playlist weeks in advance, or simply streams a mix they downloaded off the internet. At this party, the DJs will have to stay on their toes to play a song that mixes well with the one the DJ before them just played. And if they don't play music people love, they get skipped! On Turntable.fm, people get to rate music by designating a song as "Lame" or "Awesome." In real life, we don't have buttons, but what we do have is a dance floor. DJs will be scored by how many people are dancing. If they get more people dancing, they get more points. If people stop dancing, they lose points. So if you, the dance-craving masses, don't dig a DJ's selection, you can vote with your feet. A good song will surely be right around the corner! Be one of the badass DJs. You've got thousands of points. You scored the blinged out gorilla avatar before all your friends. You drop tracks that make people go nuts. You maybe haven't been very productive at work lately. 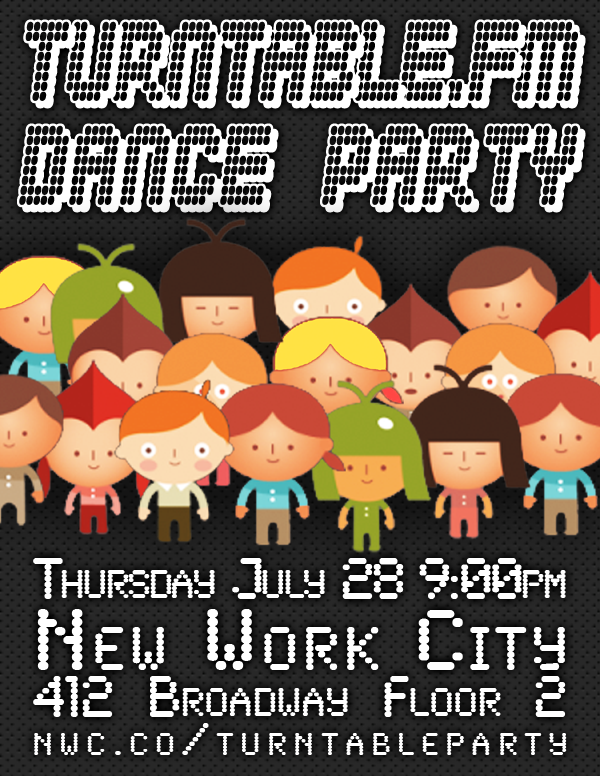 You can be in NYC, ready to bring your insane DJ skills, on the night of July 28. You're a big enough deal that you can get ten of your friends to come to the party to see you spin. If you think you have what it takes to be one of the party's DJs, apply here: http://nwc.co/applytorock We'll be awarding spots to a select group of rocking DJs who are ready to bring some amazing tunes and help make the party a huge success. Every DJ who applies gets a discount code for their friends, and selected DJs get into the party free! Drinks are complimentary and included with admission, so you are all set once you get in the door! Our fabulous resident bartender, Fredrick, will be behind the bar serving up beer, wine, and maybe even some expertly crafted mixed drinks if you ask nicely. If you'd like to join forces and sponsor our fab little party, get in touch! Email Tony at tony@nwc.co. This is one big experiment. Nothing quite like this has ever been done before, so we'll be improvising a little as we go. We've got contingency plans in case there are technical difficulties. If you have an amazing idea to make the party even awesomer, let us know! If possible, we'll let people who can't make it to the party tune in online and possibly even see a video stream. Stay tuned to @nwc for updates! Also, just to be clear, we don't have any official affiliation with the fine folks at Turntable.fm. We're just big fans. Also, while we're at it, this party is for folks who are 21 and older. If you're under 21, enjoy it while you've got it! New Work City is a club for independent workers. Joining New Work City is easy-- just bring a laptop, some work to do, and a friendly disposition!